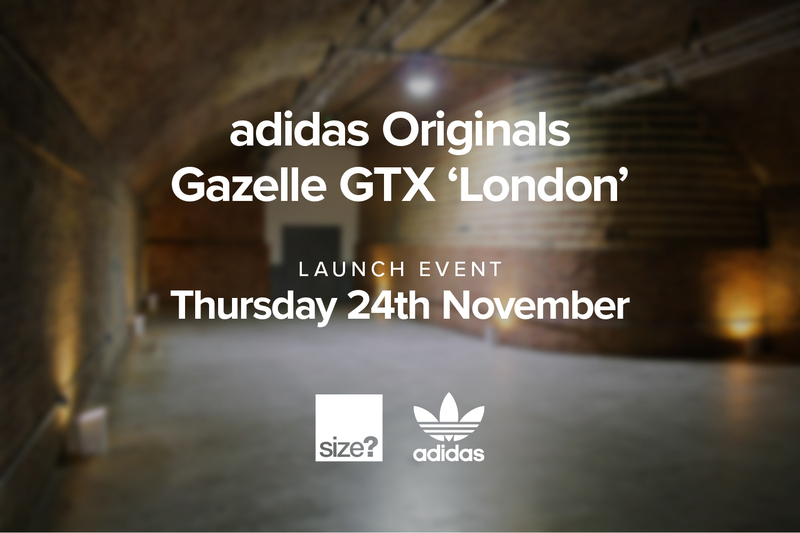 In celebration of the release of our Gazelle GTX ‘London’ together with adidas Originals, we’re hosting a special launch event in the capital on Thursday 24th November, and we’d like you to come along! A get together to honour all things Gazelle, guests will also have the opportunity to check out the next set of installments from our Gazelle GTX City Series releasing in the coming months. We’ve got 10 invitations to give away, with each invite including an accompanying +1 guest to come along to our party down at Kachette, Shoreditch. To enter, all you have to do is email us on RSVP@size.co.uk with both names of whom you’d like to attend. The Competition is now CLOSED! Thank you to all who entered, all winners will be contacted by email. Entrants must be 18 or over. Employees (and their immediate family) of JD Sports Fashion PLC, its associated companies or anyone else professionally connected with this competition are not eligible to enter the competition. No purchase is necessary; all prizes are subject to availability. Travel & accommodation will not be provided as part of the prize, winners must make their own way to the venue. The winner will be drawn at random from the successful entrants. The prize may not be exchanged for a cash value, nor is it transferable. If the prize is not available JD Sports Fashion PLC is under no obligation to supply an alternative prize. The Promoters’ decision is final and binding on all the entrants, the running of the competition and the winners. The winner will be notified by email. In the event a winner does not communicate his/her acceptance within 24 hours, size? reserves the right to pick another winner and the person not responding will waive his/her rights to a prize. For the name and county of the winners please send a S.A.E. to the JD Sports Fashion Group, size? Marketing Department, Hollinsbrook Way, Pilsworth, Bury, Lancashire, BL9 8RR. The JD Sports Fashion Group will use personal information which you provide, or which we obtain through our dealings with you, to administer the competition. We may, with your permission, also use it to tell you about our products and offers, and for market research including analysis and development of our products and customer relationships.